Earlier Springs Due to Climate Change? In North America, most birds are wrapping up another breeding season. Some, like Arctic shorebirds, are already leaving their breeding grounds and heading south for the winter. Other birds may be feeding fledglings. Still others may be working on their second or even third broods. Some, like American Goldfinches, are just getting started since they wait for the late summer crops of thistle seeds to become available. Bernd Heinrich discusses all of the activities that go into a bird's reproductive cycle in his new book, The Nesting Season: Cuckoos, Cuckolds, and the Invention of Monogamy. Reproduction is a core instinct for birds, along with escaping predation and finding enough food to survive. Reproduction means more than the brief cloacal kiss that most birds use to copulate. Birds have particularly complex reproductive lives. There are a variety of preparatory activities for mating and nesting, and after copulation, the parents need to incubate and care for their offspring. Many of them migrate, which affects when they can start and end their breeding seasons and how their young develop must take account of that. Most birds also bear young that require substantial care in their early stages so that adults cannot just lay the eggs and leave like reptiles do. Even precocial chicks need some feeding from adults and careful shepherding to keep them from harm. Nest parasites like cowbirds and cuckoos come the closest to abandoning their eggs, but even those birds need to watch their hosts carefully prior to leaving an egg to make sure that the nest is in use and that the timing is right. Each chapter discusses a different aspect of nesting: establishing a territory, finding a mate, avoiding predation and parasites, selecting a nest site, building a nest, laying eggs, and care for the young after they hatch. Heinrich chose to focus on common problems in reproduction and then discuss how different species approached and solved them. Since Heinrich spent his early years in Germany and traveled in Africa, he is able to incorporate European and African species into his discussion of nesting behaviors, in addition to the birds that will be more familiar to North American readers. This may sound somewhat dry, but Heinrich's writing keeps the text lively, even over the nearly 300 pages of text. Heinrich builds each chapter around his own observations, which seem to be drawn from his notebooks. To introduce a new topic, he first presents a series of dated observations. These may be the dates bird species arrive in the woods around his home or records from when he checked birds' nests for their contents or materials. Any such observations are related in first person so that the text feels like storytelling even after Heinrich shifts from his own observations to the theoretical explanations for birds' reproductive behavior. This structure suggests not just a writing style but a method. Observation sparks curiosity and investigation, which in turn leads to a better understanding of birds' behavior. This suggests a model that birders could emulate, though some of Heinrich's experiments (especially ones that involve climbing trees or dissecting dead birds) will probably not appeal to many birders to carry out themselves. I have not read many of Heinrich's other books (a situation I am trying to remedy) so I cannot compare this book to them. 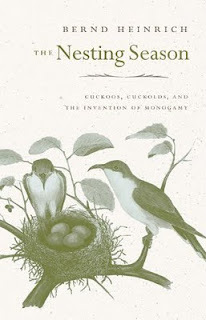 However, I can say that The Nesting Season: Cuckoos, Cuckolds, and the Invention of Monogamy is a highly readable and informative discussion of birds' nesting activities. I would recommend it to anyone who wants to learn more about how birds manage their breeding responsibilities or for general nature reading. This review is based on a copy provided by the publisher. Late summer seems to be the peak time for wasp diversity in my area, and already there are some signs of that. I have been seeing some yellowjacket-like wasps and some Polistes wasps for a few weeks now. Yesterday I noted a couple more interesting wasps in my backyard. The wasp above is fairly large, with a striking black and yellow pattern on its abdomen. While most wasps with a band pattern seem to have bands that circle the abdomen completely, on this individual, the bands are interrupted. In fact, the gaps between the halves of each band grow wider towards the back of the abdomen, a feature that is indicative of Bicyrtes quadrifasciatus, according to BugGuide. This individual had one other interesting feature. Its left hind leg is truncated. I wonder if it emerged this way or if it lost part of its leg during an unfriendly encounter. Another common backyard wasp is this potter wasp, which appears to be Eumenes fraternus, a common eastern species. These wasps build mud nests in which they lay their eggs, along with food in the form of small caterpillars. I caught this one in the act of grooming itself. Scientists studied how far toucans disperse seeds by tracking them with GPS backpacks. Toucans disperse seeds an average of 472 feet from the food source, which makes them an excellent means of seed dispersal. For Acorn Woodpeckers, cooperative breeding is more helpful in times of plenty than in times of scarcity. When food is scarce, the helpers tend to use up more resources than they bring in. The BLM is working on a new management plan for Greater Sage-Grouse on its lands. A Forest Service study concluded that reducing clear-cutting in western forests to help Spotted Owls and salmon also turns the forests into carbon sinks. Meanwhile, the BLM will have to set aside a management plan that called for more logging in northwestern forests because of a legal error. The House of Representatives is working on a bill that would make sweeping changes to bird conservation, including defunding programs like the State Wildlife Grants and enforcement of the Endangered Species Act. If it passes, this will probably die in the Senate, but it is indicative of the hostile political atmosphere for wildlife conservation. Three Osprey chicks in the U.K. have been equipped with satellite trackers to record their journey to Africa for the winter. The Abstract: What Do Bees See? And How Do We Know? A mountain lion born in the Dakotas crossed the U.S. before dying in Connecticut. Most climate scientists disagree with a paper that claims to debunk carbon dioxide as a driver of climate change. The paper claims that random variations in cloud cover drive climate change instead. Agave, a desert plant used for tequila production, has potential as a biofuel crop. Production of fuel from agave would require less energy input and produce less carbon dioxide than production of biofuels from corn and would not take arable land out of food production since agave can grow in marginal areas. The governor of California wants to see an increase in distributed power generation through means like rooftop solar and small wind turbines. The government is considering a plan to remove four dams from the Klamath River in California to allow salmon to pass upstream for spawning. The plan has support from native tribes, farmers in the region, and the power company that owns the dams, which would save money by tearing them down instead of building fish ladders. The Hudson River still has high levels of sewage-related bacteria as a result of discharges at the North River Wastewater Treatment Plant. New research seeks to provide guidance on when conservationists should move species that may be affected by climate change. Yesterday the AOU published its 52nd Supplement to the AOU Checklist (pdf). Each year, the supplement contains additions, splits, lumps, and other revisions made by the AOU's checklist committee at its spring meeting. There are a number of significant changes in this year's supplement. One of them is a split in the moorhens: the Eurasian form retains the name Common Moorhen (Gallinula chloropus), while the American birds become Common Gallinule (Gallinula galeata). The change likely to cause the most controversy is a full-scale revision of the wood warbler family (Parulidae). The move has been rumored for almost a year since the publication of a proposed reclassification of the family based on genetic analysis. I have avoided talking about the proposed changes since I do not have access to the original research informing the changes, but there are several summaries on the web. A good discussion of the reasoning behind the changes is at Biological Ramblings. There are some additional diagrams of the changes on David Sibley's blog. The short version is that genetic relationships do not match the traditional division of the wood warbler family into genera. The result is a reordering of the genera, with some being folded into others. Seiurus: This genus has one species, Ovenbird, which is unlike most of the other warblers in its appearance and habits. Helmitheros: Another genus with one species, Worm-eating Warbler. Parkesia: The two waterthrush species, which were split from Seiurus last year. 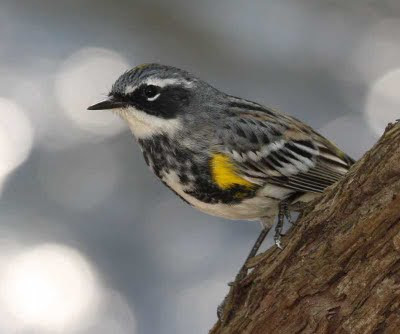 Vermivora: This genus lost several species to a split last year and now contains only the extinct Bachman's Warbler and the closely-related Blue-winged and Golden-winged Warblers. Mniotilta: One species, Black-and-white Warbler. Protonotaria: One species, Prothonotary Warbler. Limnothylpis: Yet another genus with only one species, this time Swainson's Warbler. Oreothlypis: This genus was created last year with most of the former Vermivora warblers and two members of the Parula genus. Leucopeza: One species, the possibly-extinct Semper's Warbler. Oporornis: Most of the former members of this genus were moved into the genus below; it now contains only the Connecticut Warbler, which has the unusual habit (for a warbler) of walking on the ground. Geothlypis: Traditionally this genus only the yellowthroats. Now it also contains the species exiled from Oporornis (like Mourning and Kentucky Warblers). Setophaga: While originally this was a small genus, containing only the American Redstart, it now contains all of genus Dendroica and two species of genus Parula, as well as the Hooded Warbler. Even though this is basically the old Dendroica genus, it is called Setophaga because that name has priority (i.e., it was published earlier in the historical record). The move results is an old situation where the family Parulidae no longer has a matching genus Parula, and the name Dendroica disappears from the checklist. Myiothlypis: One species in North America, Buff-rumped Warbler. There are more species in this genus, but most of them are in South America. Basileuterus: This is another Neotropical genus. This genus and Myiothlyis were traditionally considered a single genus. Cardellina: This genus contains the Red-faced Warbler, as well as two members from Wilsonia and two from Ergaticus. Myioborus: These are the Neotropical redstarts and whitestarts. Zeledonia: Wrenthrush, a Neotropical species. Icteria: One species, Yellow-breasted Chat, an oddball among warblers. Xenoligea: One species, White-winged Warbler. Microligea: One Neotropical species, Green-tailed Warbler. The last few genera, including the Yellow-breasted Chat, may not belong in Parulidae at all, but the AOU has held off reclassifying them, perhaps until there is better evidence about where they truly belong. Over the past few months, several people have contacted me out of concern about the changes, especially the removal of the name Dendroica from the official taxonomy. I have been using the name "dendroica" as an internet handle since 2005, on this blog, on Twitter, and elsewhere, so I am sad to see that it will not longer match a warbler genus. At the same time, taxonomy is constantly subject to revision as new relationships are discovered, and the best available science today may be overturned tomorrow. Meanwhile, others have noted that Archaeopteryx has many features that are only found among the deinonychosaurs. For example, they share a distinctive hip bone, and they both have a large hole above their noses (the “premaxillary fenestra”) that other birds and dinosaurs lack. Any many of the features that supposedly characterise Archaeopteryx and other birds, such as feathers, a wishbone and long powerful forearms, are also found in deinonychosaurs. This is more than just a matter of shuffling cards. Archaeopteryx’s position has been so sacrosanct that its body had guided many of our ideas about the origins of birds. It grounds our understanding of this group. For example, it was previously thought that most primitive birds and their closest dinosaur relatives had lightly built skulls, which might have been useful for flight. “Instead, our study suggests that primitive birds had robust and rigid skulls,” says Xu. But Gerald Mayr, who studies fossil birds at Germany’s Sneckenburg Museum, is unimpressed with the new discovery. “I fear that it is a bit hyped and that the conclusions are not as novel as the authors claim,” he says. Mayr is one of several palaeontologists who think that the deinonychosaurs are actually birds themselves. According to him, they’re flightless members of a group that includes Archaeopteryx and modern birds, like smaller extinct versions of today’s ostriches and emus. See his blog for pictures of the new species, Xiaotingia, and diagrams of the new proposed taxonomy. Whether or not the authors are correct in their placement of Archaeopteryx among the deinonychosaurs, it is clear that there were a lot of proto-birds and bird-like creatures and deciding which deserve to be called "birds" and which "dinosaurs" is not necessarily easy. There are relatively few fossils at that point in the lineage, so there is potential for one or two discoveries to disrupt the current alignment. Wherever Archaeopteryx belongs on the new taxonomic tree, I think it is still safe to see it as symbolic of the evolutionary relationship between birds and dinosaurs, even if it does not belong in the direct lineage of modern birds. One advantage of having a lot of native plants in the backyard is that those plants tend to attract a lot of butterflies and moths. Some come looking for a nectar source; others want to find good host plants for laying eggs. In my backyard, I have recorded over 20 species of butterflies (and many more moths). Some of them were probably just passing through (especially the Monarchs), but others are probably hosted here. This Red Admiral was sunning itself on a grape leaf yesterday evening. It was soon joined at its sunny perch by an Eastern Comma. The two butterflies circled around each other a few times at first, but both soon settled down on nearby grape leaves. A Spicebush Swallowtail was also patrolling in the area of the grape vines, and it landed in the grass a few times. When I first encountered this dragonfly on the D&R Canal on Saturday, I identified it as a Dragonhunter. As it turns out, that was wrong. It is actually a Black-shouldered Spinylegs, another clubtail species. Even so, it is still a lifer, and it is still my first clubtail species. Thanks to Tom and Julie for correcting the idea. I found this Red-banded Hairstreak sipping nectar at one of the coneflowers in the backyard yesterday. It is at least the third year that this species has appeared in the yard. They show up sometime in July and appear in ones and twos for the rest of the summer. Red-banded Hairstreak have undergone a steady northward range expansion. Half a century ago, this species was rare in New Jersey; according to Gochfeld and Burger's Butterflies of New Jersey, there was only one record before 1940 and scattered records after that. However, in the last few decades, it has invaded the state and become rather common. Despite the record-setting heat wave,* I was out yesterday morning for some exercise and wildlife watching along the Delaware and Raritan Canal near Blackwells Mills. Cicadas were out in full voice, while birds were mostly quiet. In fact, were it not for a Carolina Wren near the very end of the walk, I would have gone the whole trip without hearing any birdsong. I believe the last time that happened was probably sometime in the winter. The heat and the loud cicadas probably had something to do with that, but it is clear that the breeding season is winding down, and along with it the need for singing. The few dragonflies that were not Slaty Skimmers seemed to be mostly Widow Skimmers, like this male. While the diversity was relatively low, I like both of these species, so I was happy to see so many of them along the canal. I was surprised to see very few Blue Dashers and only one Eastern Pondhawk. Normally these guys are pretty numerous. Many dragonflies were cruising back and forth over the canal without landing very often. Some were clubtail-shaped; others looked more like skimmers or darners. I was not able to get positive IDs for most of the fliers. However, this dragonfly landed just long enough for me to take a couple photos. I think it is a Dragonhunter, which would be a life dragonfly for me. Besides the dragonflies, there were quite a few damselflies in action. Most of them seemed to be Blue-fronted Dancers, like this female. * Here is a graphical representation of the last week's weather. This cardinal flower picked a bad week to bloom, as we are in the midst of an extreme heat wave. (It even set an all-time record in Newark.) It seems to be coping well, though. Hummingbirds have flexible bills that allow them to snap their mouths shut around insects more quickly than they could using jaw muscles alone. Insects form a crucial part of hummingbird diets, as they provide more proteins than nectar. The American Bird Conservancy warns that the draft for new federal wind energy guidelines does not contain sufficient protections for migratory birds. State forest land in Oregon has potential future territories for Spotted Owls if the current trees are given a chance to mature into old-growth forests. Some bird species, such as Scaled Quail, Loggerhead Shrike and Rock Wren, are less affected by heat and wildfires in their habitats than others. New research argues that young puffins explore their own migration routes rather than learning from their parents or using a genetically predetermined route. Waterfowl breeding in the northern U.S. and Canada had an unusually productive breeding season in 2011. 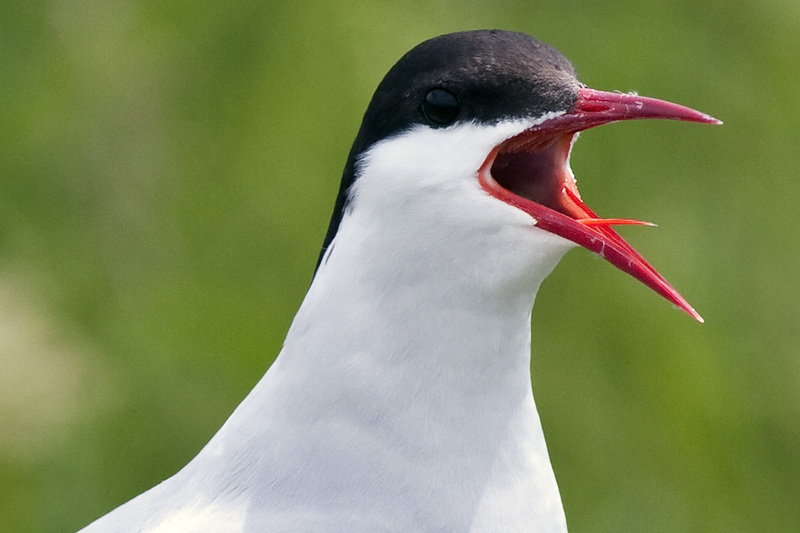 Arctic Terns have the longest annual migrations and see the most sunlight of any bird species. Earlier this week, Mongabay.com featured a Scale-crested Pygmy Tyrant as its picture of the day. The Pied Wagtail is a common but sometimes overlooked bird in Europe; a column in The Guardian sums up its appearance and habits. The Iowa DNR is requiring the use of non-lead ammunition for its new dove hunting season. Mass extinctions may be easier to trigger than commonly thought. The end of the Triassic appears to have come with a small rise in carbon dioxide, which caused a larger release of methane gas in a warming feedback loop. Arctic sea ice is at a smaller extent than at the same point in July 2007, the year of the lowest sea ice extent ever recorded. There is a strong possibility that 2011 will break that record if trends continue. Typically Arctic sea ice achieves its lowest extent in September of a given year. A female polar bear wearing a GPS logging device was recorded swimming for nine days straight and covering a distance of 426 miles. This is the longest swim by a polar bear ever recorded. A new study identifies six new species of ermine moths from Costa Rica. These moths are in the family Yponomeutidae, which also includes the Ailanthus webworm. A new study identified an eye gene called optix as the gene responsible for mimicry of red wing colors in butterflies. The Grand Cayman blue iguana population is recovering from near extinction. This year's dead zone in the Gulf of Mexico has potential to be the largest ever, thanks to unusually large amounts of sediments and nutrients being carried downstream by the flood waters. Meanwhile, Disko Bay in Greenland had its longest-ever algal bloom this spring. An expedition to the Marquesas Islands in French Polynesia found 18 new species of ferns and flowering plants. A coalition is working on adapting the Nisqually River in Washington so that it will retain its character and productivity even as the climate warms. The Friends of the Wissahickon are experimenting with Angora goats as a means of controlling invasive plants in Wissahickon Valley Park. Scientists have determined that the underwater plume observed in the Gulf of Mexico last summer was composed of BTEX chemicals (benzene, toluene, ethybenzene, and total xylenes) that were released from the leaking oil well. On a hot day, you need to do whatever you can to keep cool, especially if you have to be out in the sun. Humans, at least, have the ability to sweat: the skin produces moisture, and the heat makes it evaporate, cooling the skin. (At least that is how it usually works; if the humidity is sufficiently high, that moisture will not evaporate easily.) Birds cannot sweat, so they have to find other ways to cool down. One way is by panting: they open their bills to let heat escape through their mouths. The scientific theory known as Allen's Rule states that warm-blooded species from colder climates usually have shorter limbs or appendages than the equivalent animals from warmer climates. The team's new findings are a new example of Allen's Rule that confirms the importance of physiological constraints on the evolution of vertebrate morphologies, even in bird bills. The full paper from Ecography is online via the Smithsonian site (pdf) if you want to read it. I was surprised that the press release did not mention which bird species were involved in the study since that is one of the first things I wanted to know. 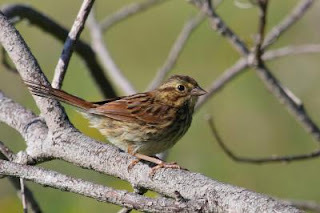 From the paper, I can see that they used four subspecies of Song Sparrow (Melospiza melodia atlantica, M. m. pusillula, M. m. samuelis, and M. m. maxillaries), two subspecies of Savannah Sparrow (Passerculus sandwichensis rostratus and P. s. beldingi), one subspecies of Nelson's Sparrow (Ammodramus nelson subvirgatus), Saltmarsh Sparrow (Ammodramus caudacutus), and two subspecies of Seaside Sparrow (Ammodramus maritmus maritimus and A. m. fisheri). Some breed along the Atlantic Coast, some along the Gulf Coast, and others on the Pacific Coast. I already wrote a bit about visits to Muckshaw Ponds Preserve and Whittingham WMA. Those posts focused on the birds and dragonflies that I encountered at those two locations. In this post, I would like to show a few moths from the two preserves. The first is a moth that was new to me. As I was trying to extricate myself from an overgrown path at Muckshaw Ponds, this tiny moth fluttered up and landed on a vine. It is a White-striped Black (Trichodezia albovittata), a type of geometer. This species is a denizen of wet woods; in its caterpillar stage, it feeds on jewelweed (Impatiens sp.). This moth is a Wavy-lined Zanclognatha (Zanclognatha jacchusalis). Like other moths in subfamily Herminiinae, its caterpillars probably feed on dead leaves on the forest floor. The dense shade from the forest canopy meant that I had to use the camera's flash on this moth and the ones above and below it even though the day was bright and sunny. I found Speckled Renia Moths (Renia adspergillus) at both preserves. This moth species is very common in this area; I have found it at home and elsewhere on several occasions. Finally, this Confused Eusarca (Eusarca confusaria) was on one of the side paths at Whittingham WMA. I have yet to see a good explanation of what makes this moth confused. Common Cattails (Typha latifolia) have a regular presence in our freshwater marshes. But how much do we notice them? As I passed a stand of cattails yesterday, I noticed that several older stalks, probably from last year, still stood among this year's cattails. (You can see them in the background on this photo.) I cannot remember thinking about that before, but I must have seen older, dried cattails in previous summers. Cattail stalks include two spikes of flowers. A thick, dark brown spike contains the female flowers. These are pollinated by male flowers that grow in a thin, light brown spike just above the female flowers. Once the seeds mature, the thick spikes become fluffy, and the seeds are dispersed by wind. I imagine that these older stalks with fluffy heads give birds and mammals some soft material for their nests during the breeding season. After wandering around Muckshaw Ponds Preserve in the morning, I spent Saturday afternoon at Whittingham WMA, which is conveniently located across the road from Muckshaw Ponds. (In fact, one of the WMA parking lots serves as parking for Muckshaw ponds.) Whittingham WMA is a 1,930-acre refuge that shares much of the same geology as its neighbor. Low limestone ridges alternate with depressions that hold wet areas. However, the public areas at the two sites have different characters. While the trails at Muckshaw Ponds pass through dense forests, Whittingham WMA is more open, with several large meadows in addition to the wooded ridges. In addition, the WMA includes a spring that serves as the principal source for the Pequest River and fills a series of ponds that are partially visible from the trails. The bird species I encountered were much the same as in the morning. I did not see or hear a Hooded Warbler, but I did find a few new birds for the day. It was nice to see a Scarlet Tanager and hear a Prairie Warbler near the entrance. I found a handful of Blue-gray Gnatcatchers at the edge of a clearing in the woods. One pond had a female Gadwall in addition to the Wood Ducks and Mallards. Finally, I heard an Acadian Flycatcher calling; I have not heard many of them since moving back to this state. There were a lot of dragonflies active in the refuge's meadows and clearings. The most numerous were ones like the meadowhawk above. From what I have read, this falls into a species complex that is not field-identifiable in New Jersey. The complex includes Ruby Meadowhawk, White-faced Meadowhawk, and "Eastern" Cherry-faced Meadowhawk, all of which have overlapping characteristics. Whatever these were, they were all over the place. As you can see, I got myself an insect net and started netting dragonflies this weekend. The very first dragonfly I netted was this Great Blue Skimmer, which I think is an immature male. (You can see it perched here.) Catching them turned out to be easier than I expected, at least for the perched dragonflies I practiced on. All were released unharmed. The Great Blue Skimmers at Muckshaw Ponds and Whittingham were probably my odonate highlight for the day. While widespread in New Jersey, they are easy to miss among the other blue-colored dragonflies. I saw relatively few Eastern Pondhawks, but I did catch up with this lovely female. New Jersey's northwestern counties are part of gives the state such incredible biodiversity for its size. While the southeastern end of the state has more in common with the Delmarva Peninsula or the Carolinas, the northwestern end is more like upstate New York. Though I grew up in New Jersey, and have now spent several years in the state as a birder, I have not explored a lot of the state's northwestern corner. So I spent yesterday morning at Muckshaw Ponds Preserve near Springdale in Sussex County, a county I think I have only visited once previously. Muckshaw Ponds Preserve is a 530-acre refuge run by the Nature Conservancy. It consists of a series of low, parallel limestone ridges. In the depressions between the ridges there are a series of ponds and a few meadows. A lot of the birds have quieted down by now, but some were still singing. The highlight was a Hooded Warbler that I heard on the way in and the way out. I finally managed to track it down and see it on the second hearing. Other birds included Indigo Bunting, Field Sparrow, Common Yellowthroat, Yellow-billed Cuckoo, Red-eyed Vireo, and Yellow-throated Vireo. A family of Wood Ducks (I counted 8) swam past in one of the ponds. I heard several flycatchers – mostly Eastern Phoebes and Eastern Wood-Pewees. I could tell that they must have a lot to eat there since the mosquitos were so thick in the air. I imagine that there would be a greater variety of avian songsters on a visit in May or June. One reason I was interested in this particular preserve was to find unusual insects around the ponds. Unfortunately, I did not see as many dragonflies as I had hoped. I think that may partly be because I spent so much time in the woods instead of in meadows or around the pond edges. However, I did see a few, such as the Widow Skimmer above. I found this Slaty Skimmer along a narrow, rocky pathway between two ponds. This Great Blue Skimmer confused me initially, but eventually I figured out what it was. I mentioned this in yesterday's Loose Feathers round-up, but I thought the news deserved its own post. It seems very likely that Red Knots will soon be listed under the Endangered Species Act. Such listing has been overdue for some time now, and several petitions have been filed with the U.S. Fish & Wildlife Service. So far it has lingered among the over 250 species on the candidate list. A plan to expedite review and listing of the candidate species was developed as a result of a lawsuit brought by WildEarth Guardians and the Center for Biological Diversity. From what I have read, the Red Knot will be near the front of the list, though formal listing might not come for a year or two. During the 1980s and '90s, peak Delaware Bay counts of the red knot reached 95,000. Since 2004, they ahve been consistently below 16,000. Likewise, in their wintering area at the tip of South America, peak counts have dropped from 75,000 to 16,260 in 2010. At the winter count earlier this year, the number had declined to less than 10,000. Meanwhile, a recent study by New Jersey biologist Larry Niles, who has followed the bird to the ends of the earth in a decade or more of study, and others has confirmed the key role that horseshoe crab eggs play. "Right now, we need to see more adult crabs breeding, and we're not," Niles said. Fisheries officials that govern the crab harvest keep saying to give it more time, he said. "That would be fine, except we were promised signs of recovery six years ago." He suspects further restrictions in the harvest are needed. Or the problem now may lie elsewhere. The illegal harvet may be greater than estimated. The blood of the crab is used as an indicator for contamination in medical devices, and the crabs are caught, partially bled and then returned to the wild. But a recent study suggested that mortality from this may be higher than estimated. I wrote about the study connecting Red Knots to Delaware Bay stopover habitat last week. Habitat protections might also result, though a lot of the Red Knot's habitat falls outside of the U.S. – in Canada for breeding and in southern South America for wintering. Either way, it is a positive step forward, and I hope it results in a stronger Red Knot population. Now that the US Fish and Wildlife Service has settled a lawsuit against it, the Red Knot will be among the highest priority species for listing. The settlement covers 757 species, including 60 in the Pacific Northwest. A colony of Great Gray Owls were found on timber company land in California – in oak-pine habitat near active logging operations. The discovery opens the possibility that other colonies exist outside of the owls' expected habitat and range. Towns in Indonesia are building bird houses specially designed to lure Edible-nest Swiftlets to build nests that are suitable for bird's nest soup. 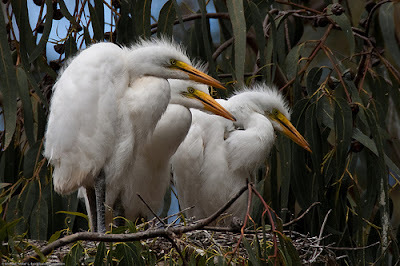 An essay describes the experience of a boat tour of egret nesting sites along the East River. A driver in Staten Island deliberately drove his car into a flock of Wild Turkeys. Here is a photo of a Knobbed Hornbill. Despite their smaller brains, owls have a similar ability to see and appreciate three-dimensional objects as humans. A woman in the U.K. found a ghostly image of an owl on her window. The image was created by powder down released when an owl hit the window. The owl's fate is unknown. Birds have repopulated their nesting territories on Gaillard Island in Alabama a year after the Gulf oil spill. Conservationists worry that Canada does not have adequate protections in place for the Whooping Cranes that migrate through the oil sands region. Outside My Window: Does Half a Degree Matter? WorldWaders News Blog: Where are the Red Knots of the EAAF during spring and autumn migration? An Asian stinkbug, Megacopta cribraria, was recently discovered for the first time in Georgia. This stinkbug species attacks and weakens kudzu, so it may slow down the growth of kudzu vines. However, entomologists are concerned that the stinkbug could turn its attention to soybean and peanut crops. A viable population of snow leopards was discovered in Afghanistan. Here is a gallery of treehopper helmet designs. New Jersey is second in the U.S. in the amount of solar power it generates. Despite its small size, it jumped ahead of sun-drenched western states by setting aggressive goals for its renewable energy standard. Residents along the Gulf Coast are still feeling the effects of last year's oil spill. Human destruction of top predators has had pervasive effects on ecosystems worldwide. Puerto Rican anoles (Anolis evermanni) are able to solve intelligence tests that are usually given to birds. A comparison of farming methods found that fields sprayed with insecticides had more aphids in the long run than fields managed according to organic methods. The researchers suggested that the insecticides either killed off beneficial insects or made them seek other locations to prey on aphids, so that aphids could return to the treated fields without fear of predation. The Bornean rainbow toad (Ansonia latidisca) was photographed for the first time after its rediscovery in 2010. It was the first time the toad species was seen for 87 years. The decade 2000-2009 was less hot than predicted due to sulfate aerosol pollution from increased industrialization in Asia. This is a short-term effect, however, as the sulfates have a short life in the atmosphere, and any reduction in Asian sulfate pollution (such as less reliance on coal) will end the temporary cooling effect. Much like honey bees, I find that bumble bees can sometimes be difficult to photograph. Especially on warmer days, they often move quickly from flower to flower. Their large size and weight (for a bee) makes a lot of flowers bend or bounce, making focus difficult to obtain. Occasionally I do find a cooperative bumble bee, like this bee that was feeding on some large coneflowers. I think this is probably a Common Eastern Bumble Bee (Bombus impatiens), the most abundant bumble bee in my part of the continent. The overall pattern seems to fit, and I do not see any markings that would indicate otherwise. This bee stayed around the same group of coneflowers for several minutes and gave me close views of its face and back, including this brief view of its proboscis and tongue. I think these flowers' large size helped make them more stable and easier to bring into focus. This bee must have found a good source of nectar since it seemed so intent on drinking that it barely noticed my presence. William Boyle is known and respected for his intimate knowledgeable of New Jersey's bird populations. He has studied birds in the state for several decades, including service on the New Jersey Bird Records Committee. His new book, The Birds of New Jersey: Status and Distribution, is his latest contribution to the state's ornithological record. The Birds of New Jersey is an annotated and illustrated bird checklist for the state. 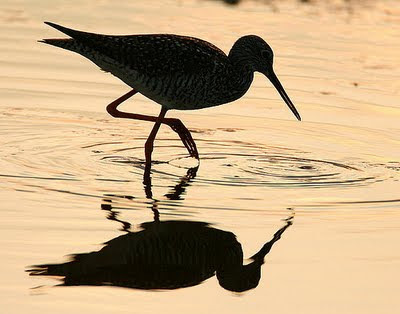 It includes all of the bird species whose appearance in the state could be confirmed by the New Jersey Bird Records Committee through mid 2010. It also includes birds that were formerly present but extirpated from the state, such as Heath Hen (a subspecies of Greater Prairie-Chicken) and Passenger Pigeon. The book follows the nomenclature and taxonomic order of the AOU list as of 2009. The book is based on several sources of data. Chief among them are the records kept by the New Jersey Bird Records Committee, which maintains the state checklist and archives the documentation of submitted records that it evaluates. Then there is a large body of historical ornithological work, ranging from catalogues of the state's bird species to classics like Witmer Stone's Bird Studies at Old Cape May. There are also the sightings from more recent birders, reported to New Jersey Birds editors, the JerseyBirds email list, eBird, and elsewhere. Historical trends can be gleaned from long-term projects like the Breeding Bird Survey and Christmas Bird Counts. Finally, there is the data compiled from 1993 to 1997 during New Jersey's breeding bird atlas project, which culminated in the publication of Birds of New Jersey in 1999. Each bird's seasonal distribution and abundance are described in the species accounts that accompany each heading. These accounts are mostly short paragraphs and note recent trends, if applicable. Some birds are clearly expanding their range and occur in New Jersey more frequently than in the past, like Cave Swallow. Others have been declining and occurring with less frequency, like Ruffed Grouse and Golden-winged Warbler. Each account is accompanied by a range map showing where it occurs in the state, with separate colors indicating summer, winter, migration, and year-round occurrence. In the case of unusual or rare species, the map is white with red dots indicating individual records. For exceptionally rare species, the individual records are listed at the end of the account with the location and date of each sighting. Only about one in three or one in four species are illustrated, but the photographs that accompany the accounts are excellent. No doubt, serious birders in New Jersey will want this book in their reference collections. It provides valuable information on status and population trends. It also illuminates the circumstances surrounding some of the rarer bird records and provides citations for further research. Unfortunately, checklists have a way of becoming obsolete very quickly, particularly in a state as saturated with good birders as New Jersey. Already, the Bergen County Pink-footed Goose from March 2011 has challenged the completeness of Boyle's list (though it should be noted that the sighting has not been approved for the official checklist yet). For the most up-to-date list of what records have been accepted, it is best to check the NJBRC website rather than a printed checklist. For birders new to the state or for New Jerseyans new to birding, another book by Boyle will be more useful than Birds of New Jersey for learning where to see birds: A Guide to Bird Finding in New Jersey. That book describes the best birding locations in the state and suggests specific sites to search for each species. For a more detailed view of bird distribution in the state, particularly breeding bird distribution, Birds of New Jersey by Walsh et al. is still the best resource, as far as I know. William J. Boyle, Jr., The Birds of New Jersey: Status and Distribution. Kevin T. Karlson, photographic editor. Princeton and Oxford: Princeton University Press, 2011. Amazon. This review is based on a review copy provided by the publisher. A story has been making the rounds about some small snails being able to survive despite being eaten by a bird and subjected to its digestive processes. 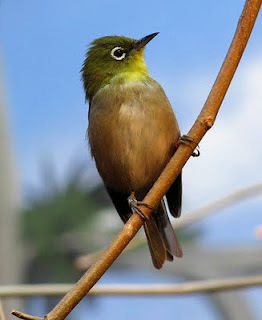 Studies of the diets of birds on the island of Hahajima identified the Japanese white-eye's preference for the tiny land snail Tornatellides boeningi. In the lab scientists fed the birds with the snails to find out whether any survived the digestive process. "We were surprised that a high rate, about 15 percent, of snails were still alive after passing through the gut of [the] birds," explained researcher Shinichiro Wada. Snails being able to survive digestion is fascinating in itself. It conjures mental images of near-death experiences or even zombies. However, in this case, it has additional significance. Scientists on the island Hahajima in Japan had noticed odd distribution patterns of Tornatellides boeningi. They found genetic evidence of interbreeding among seemingly isolated populations of the snail and other evidence of dispersal over longer distances than they would expect. If these snails can survive digestion, it is possible, indeed likely, that Japanese White-eyes carry live snails to new locations in their guts. One snail in particular helped researchers identify how numerous snails could travel over distances via bird droppings. "One of the snails fed to the bird gave birth to juveniles just after passing through the gut," Mr Wada told the BBC. The idea that some snail distribution patterns can be explained by passive transportation is not a new one. Malacologist and snail blogger Aydin Örstan has discussed dispersal by cars on a few occasions (including here, here, and in a recent paper). The idea of transportation by birds is not entirely new either, as some speculation had involved snails hitching rides on birds' feet. This seems to be the first indication, though, that snails can survive the digestion process and land somewhere other than where they were eaten. It will be interesting to see if this turns out to be true for other snail-bird pairings as well. Being eaten by a bird will not work for all snails as a means of transportation. The tiny Tornatellides boeningi are able to survive a white-eye's digestive tract because their small size makes it easier for a bird to swallow them whole. After being swallowed, they spend a relatively short time in the digestive tract. (Most songbirds defecate their meals shortly after eating them. This short turnaround makes it possible for intact seeds to survive digestion and be dispersed through defecation.) While some snails are swallowed whole, others are not so lucky. Gulls are known for dropping mollusks to break their shells if they are unable to pry into the shell by other means. Snail Kites use their hooked bills to extract a snail's soft tissues being eating them and discarding the shell. Snails subjected to such harsh treatments are unlikely to survive. Since I have been posting mostly native bees so far this summer, here is one nonnative bee that should be instantly recognizable: a honeybee. Honeybees were first brought to North America by European colonists who wanted hives to produce honey and wax. Since then they have become an important pollinator of food crops. Unlike a lot of native bees, honeybees are fully social and workers are loyal to their hives, which makes it easy for agricultural operations to set up or rent hives to provide pollination services at the key times of year. One thing I realized recently was how strange honeybees look to me now that I have been paying closer attention to native bees. I am not sure if this is because of their large size (relative to many other bees), very hairy faces, or long and cylindrical abdomens. It probably is a combination of all three. The flowers it is visiting are purple coneflowers (Echinacea purpurea). In addition to their aesthetic appeal, coneflowers provide food to a variety of wild animals, from pollinators like bees to seed eaters like finches. Yesterday I was at Willowwood Arboretum in southern Morris County. In addition to the formal mansion garden and a Japanese garden, the arboretum holds several acres of meadow habitat bordered by small patches of woodland. This makes the property an excellent place to look for insects, particularly in July and August when insect diversity is at its peak. Overall, I recorded 17 species of butterflies in Willowwood's fields yesterday. Many were common butterflies, like this Red-spotted Purple. Red-spotted Purple is actually a subspecies, Limenitis arthemis astyanax, and shares the species designation with White Admiral, Limenitis arthemis arthemis. White Admiral tends to be more northerly than Red-spotted Purple, though both subspecies can be found in northeastern states. Other common butterflies included this Great Spangled Fritillary, Monarchs, Common Wood Nymphs, and Pearl Crescents. The latter two were by far the most abundant butterflies I encountered yesterday. Strangely, I did not see any of the less common browns. This American Copper was one of the less common species I observed. This species is widespread, but apparently its abundance is highly localized. It is also tiny, which makes it even easier to miss. The meadows tend to be fairly dry, so the arboretum is not as rich in odonates as a wetter habitat would be. Still it is possible to see some pretty attractive species there. Above is my favorite dragonfly, the Twelve-spotted Skimmer. A lot of the dragonflies in the meadows cruise around fairly high off the ground, which makes them hard to photograph, and sometimes even hard to see. Another of my favorite odes is the Ebony Jewelwing, a stunning metallic green damselfly with black wings. A few of these were active along the bank of a stream that borders one of the meadows.